Regardless of your concentration, with a degree in HCAM from SRU, you will be ready to be a leader in this fast-growing industry. Why Choose Health Care Administration and Management? If you're interested in administration or management in America's largest and fastest growing industry, but do not wish to seek a clinical career, the HCAM degree is perfect for you. HCAM is also perfect for those who are currently clinical professional (physician assistants, nurse practitioners, nurses, physical or occupational therapists, lab techs, radiology techs, etc.) who wish to purse leadership roles within their disciplines. As the US population is aging and the number of Americans with access to health care is expanding, the demand for professionals in the health care industry is growing. Health care administrators and managers work with doctors, nurses and other health service professionals to enable the health care system to run smoothly and efficiently. With a degree in HCAM you will have a variety of opportunities in this growing, rapidly changing industry. As an HCAM major at SRU, you will gain a comprehensive education in health care delivery and insurance systems. You will learn leadership skills, health care ethics, legal and regulatory environments, healthcare informatics and technology, economic principles behind policy, and the foundations of health services research. HCAM majors enjoy industry experienced faculty and guest speakers from the health care industry for greater insights to their future careers and to learn current trends in one of the fastest changing industries. Students also have the opportunity to travel abroad in their course of study to gain a greater understanding of various international health care systems. Prior trips include Italy and Ireland medical facility visits as well as cultural immersion. As an HCAM major, you will be prepared to enter the workforce as a highly desirable candidate. Mack Bean's dream job is to oversee a hospital facility, and he talks about how his major is preparing him for the workforce. 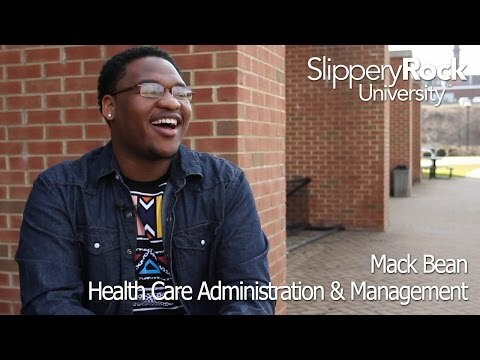 Mack discusses how his mentors on campus, Dr. David Jordan, Dr. Pease-Hernandez, Ms. Corinne Gibson, and Mr. Michael White have impacted his SRU experience. Mack is involved in a number of organizations on campus, including JumpStart, the Men of Distinction, and Future Healthcare Leaders of America. While at SRU, Mack has also been able to study abroad at the University of Costa Rica. He talks about how SRU has helped him grow into the person he is today. Management: Topics regarding effective management of organizations. Marketing: Customer service, sales, promotion. Information Systems: Knowledge of computer technology and software to aid in decision-making.